Mills CNC is a business quite literally at the cutting-edge of engineering technology. As the exclusive distributor of Doosan machine tools in the UK and Ireland, the company supplies over 450 new machines a year to the market from an extensive range of hi-tech cutting equipment, covering everything from CNC lathes and turning centres to horizontal boring machines and multi-axis mill-turn centres. These are technologically advanced machines used by many of the leading OEMs in the aerospace, automotive and specialist engineering sectors for the precision manufacture of engineering components and parts. Being extremely sophisticated pieces of kit they are high value items, costing anything from £50,000 for a small lathe, right up to £600,000+ at the top of the range. The machines are also very heavy and can often be of huge proportions – units may weight up to 55 tonnes and can measure 5m deep and up to 10m long. Therefore, handling such heavy and valuable loads with great care calls for substantial lifting power, with precision control. Although the heaviest of machine tools can only be moved by crane, the vast majority of units are within the carrying capacity of a really heavyweight forklift truck – but only the biggest and best of counterbalance trucks could do the job. Until recently the business used an old 16 tonne counterbalance truck for manoeuvring smaller lathes and machine tools at its Leamington Spa showroom and workshop facilities. However, after 20 years service it was becoming unreliable, costly to maintain and could only handle 50 per cent of the product range. 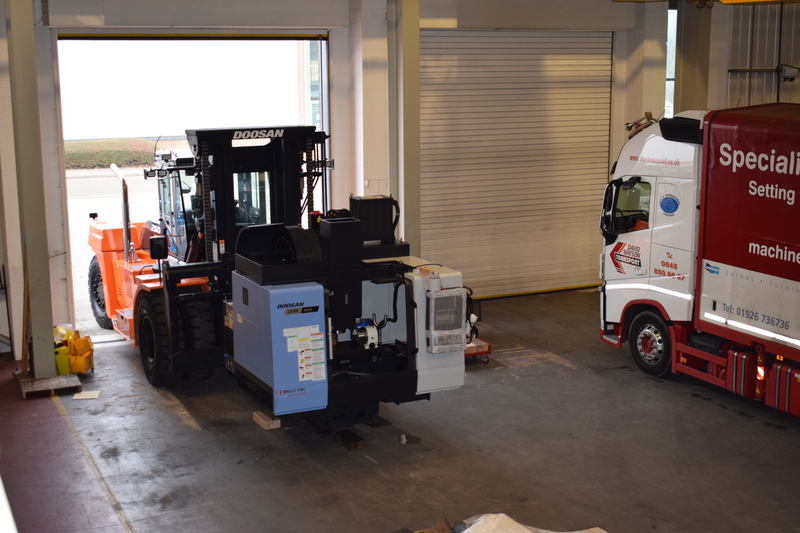 Hiring in suitable forklift trucks to cover for downtime and specialist cranes to move the larger, heavier machine tools was becoming an unwelcome expense and an administrative inconvenience. 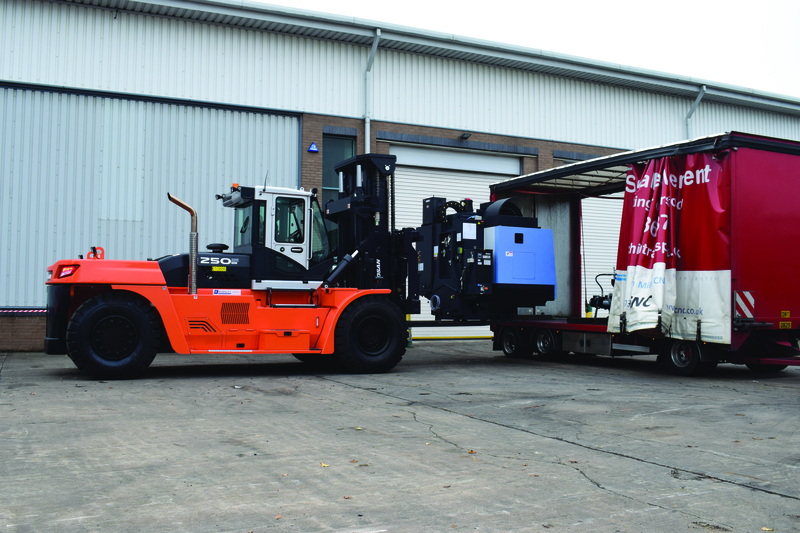 Realising the need to substantially upgrade its handling capabilities, Mills CNC turned to the forklift truck division of its close business associates, Doosan Industrial Vehicles, and after a review of options, entered into a ten-year lease and full maintenance arrangement on a Doosan DV250S-7 twenty-five tonne counterbalance forklift truck – the giant of Doosan’s comprehensive truck range. A major consideration for the business was the precision required when lifting and positioning their finely engineered machine tools. With machines capable of cutting to the micron level a mere jolt could affect the calibration and cutting performance of the machine tool. 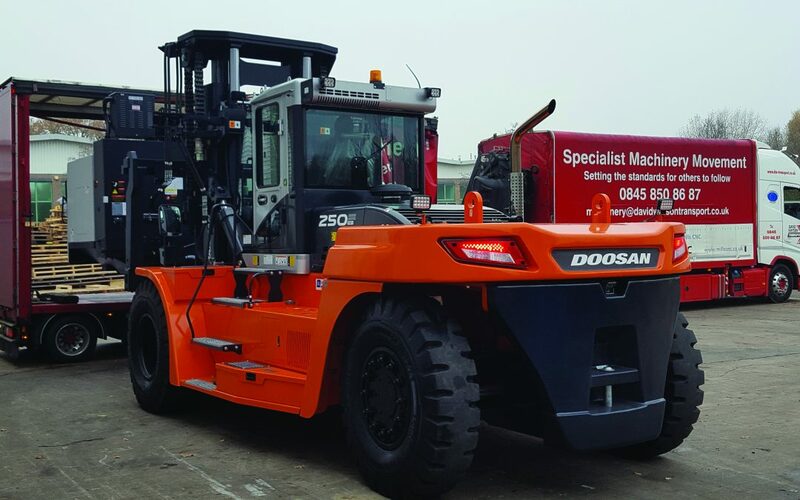 However, Andy Knight was reassured by the smooth handling characteristics designed into Doosan’s DV250S-7 heavyweight truck. Together with a comfortable driving position, power steering and load-sensing hydraulics, Doosan’s powerful low-emission engine provides high torque at low revs, reducing fuel consumption and ensuring accuracy and gentle handling.